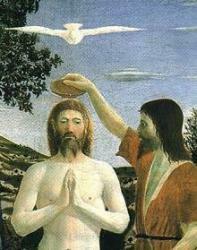 In the Renaissance painting by Piero della Francesca Christ is “baptised with the Holy Spirit”, shown as a dove. 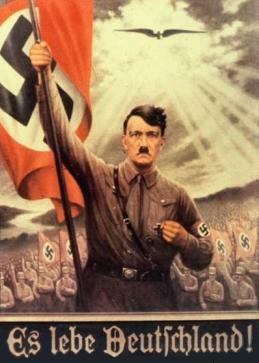 In the Nazi poster Hitler appears to be receiving the blessing of an unidentified feathered object. Both German state churches are now known to have used slave labour during World War II, but only the Catholic Church refused to join the national compensation fund. Documents imply that the churches' slave labourers were sent to death camps when they were no longer useful and that the churches knew about the death camps for the babies of the East European workers, yet said nothing. The concordat alliance between Hitler and the Vatican was primarily directed to fighting communism, but the treaty partners also shared an antipathy to the Jews. Mediaeval tales of Jews poisoning wells were updated to claim that “Jewish Bolsheviks” were now poisoning society – and godless Jews, at that. These sculptures illustrate the Christian anti-Semitism that the Nazis were able to draw upon. To the mediaeval charges against Jews (of "killing Christ", resisting the Truth and hating Christians), in the 19th and 20th centuries the Church in added new ones (of Bolshevism, capitalist exploitation, rationalism, democracy and secularism). Unlike the Nazis, it generously did not blame them for their genes, however, it was inclined to leave the Jews to their fate. Hitler said that a woman's body belonged to the German people, while the Church claimed that it was the property of the Holy Ghost. Both meant that her body didn’t belong to her and should therefore be used to produce the maximum number of soldiers and/or Catholics. The mother's cross symbolised both the nationalistic and religious pressures to reproduce.